Being Pink in color doesn't mean this broad head is any weaker than the others. 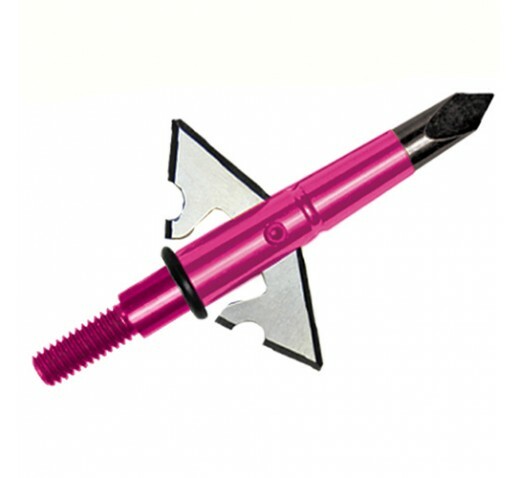 It is designed for lower poundage bows to have the penetrating advantage of higher poundage bows. Low profile by design, 7/8" in flight and still a devastating 1.5" on impact. With 0.32? thick spring stainless steel blades, hardened stainless steel trocar tip, a T-6 aluminum ferrule and the most durable o-ring retention system, Dead Ringer's use of superior materials has changed the industry and sets Dead Ringer above the competition..